I was not doing well in my public middle school. I got excellent grades and got along well with my teachers, but was something of an odd duck and was mercilessly tormented by my classmates. My life at home was also at its rockiest, and so I found little stability in my life outside of video games. Perhaps my being bullied was part of the reason I was so fond of Tails: I empathized with the fox's being teased for being different. I had not yet found someone or something to inspire me to believe in myself as Sonic had done for Tails, and so I floundered. Things hit a nadir in the middle of my sixth-grade year, and the teachers intervened on my behalf. After that, things began to improve at school: I found a circle of friends who stood by me and I began to integrate myself a little more into the class. My mother, however, perhaps fearing that my situation was unstable or maybe just wanting to give me a brand new start, decided that it would be a good idea to send me to a small private school for a while, and to repeat sixth grade at the same time. It turned out to be a very good decision. My life remained rocky, but my new education exposed me to new ways of learning, gave me an appreciation of nature and history, and allowed me to spend more time in Salem, Massachusetts, my favorite city in the United States. Where does Sonic fit into all this? Well, I changed schools in September 1993: the same month that the Sonic animated shows hit the airwaves in the United States. Even though I didn't have a Sega Genesis and disliked the company for its opposition of Nintendo, my fondness of Sonic was unmatched. I collected Sonic merchandise like crazy, particularly the Sonic board game and the Sonic 2 Tiger Handheld LCD game. My Sonic T-shirt was one of my most prized possessions, and the VCR timer was programmed to record The Adventures of Sonic The Hedgehog every weekday. The opening months of the school year ticked by. Sonic CD was released to much fanfare, as was Sonic Spinball, a surreal pinball-like adventure which I found interesting but had little opportunity to play. The pinball game was unusual in that it attempted a tie-in with the American cartoon series, since many of the unique characters in the cartoons and comic books appeared in the stages and bonus rounds. Tails had little presence, however, and so my interest in the game was limited compared to Sonic 2. Around this time, my school had a field trip. My unusual little middle school followed a brilliant one-room schoolhouse style, and so children ranging from kindergarten to the eighth grade had regular exposure to one another. The student sitting next to me on the bus, my partner for that day, was a quiet fourth-grade boy. As the bus pulled away from the school and headed down the city streets, we attempted to establish a rapport with one another in that uncertain way that kids sometimes have when shoved together for the first time. "What's your favorite TV show?" came the question. I hesitated. In public middle school, my near-obsession with video games had alienated me from my classmates. Somewhat uncertainly, I muttered, "It's a bit embarrassing. Sonic The Hedgehog." The boy next to me immediately brightened. "Sonic's my favorite, too!" Then he paused. "Why's that embarrassing?" We talked animatedly for the duration of the field trip. By the end of the day, my new school didn't seem so scary. A few weeks later, we had another trip, and as luck would have it, the same boy was a part of my group for the day. We also had a little third-grade girl with us, and lo-and-behold, she was also a huge fan of Sonic. We had a great day. The trip was to the salt marshes, and we walked around, sketching pictures and writing notes. At the end of the afternoon, we walked with one of the other guides clear to the other end of the marsh and watched as he collected the samples. We had a great experience, but the teachers were understandably unhappy with us for wandering so far afield. On the bus ride home, I rested my head against the window, with the fourth-grade boy asleep on my shoulder, and the third-grader, in turn, asleep on his. That bus ride remains in my memory as one of the most peaceful, contented, secure moments of my middle school life. Now, a budding friendship between a third-grade girl and a sixth-grade boy, no matter how innocent, is the kind of thing that is sure to make some parents nervous. That friendship didn't survive through the end of 1993. The fourth-grade boy, on the other hand, became a fast friend. 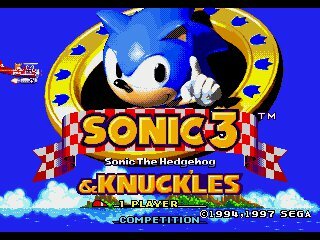 1994 came, and with it one of the greatest games to ever hit the Sega Genesis: Sonic The Hedgehog 3. Sonic 3 was colorful, fast, and a great improvement over its predecessor. It also introduced the character of Knuckles The Echidna, Sonic's red-hued rival who would later become his trusted friend. The hype surrounding the release of the game was substantial, and there was a massive movement among my schoolmates to determine just what an echidna was. Why an egg-laying spiny anteater was chosen as Sonic's rival, nobody can say, but the character inspired an entire student-taught workshop at school. How's that for games being educational? In the opening months of middle school, I made another friend, a fellow sixth-grader. We played a myriad of games together, not the least of which was Sonic 3. The play style of Sonic 3 suited me wonderfully. The graphics were bright and crisp, and the game contained a save feature, which was a very welcome addition, as we could start the game one day and continue it another. The play control was tight and responsive. And the music! The music was phenomenal. Each act within a zone had its own theme, and all of the themes were spectacularly catchy. The level design was also gorgeous: even the very first Angel Island Zone, which went from lush jungle to blazing firestorm, was an impactful addition. 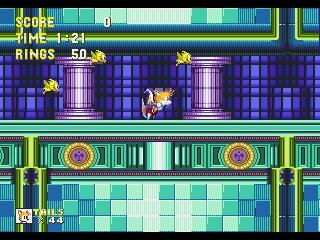 The special stages, which were cleverly hidden within the Zones and had to be completed in order to get chaos emeralds, were much more suited to my playing style than Sonic 2's ring-filled half-pipes. Sonic had also gained some moves, particularly the ability to create in instantaneous shield in mid-air in order to protect himself from harm, and the ability to use special abilities when equipped with shields of fire, water, and electricity. The electric shield was particularly fun: it attracted rings, items that helped Sonic survive damage. And, finally, Tails could fly. Not only could he fly, but he could carry Sonic! This brilliant play mechanic gave true value to the second-player role. I, naturally, insisted on using Tails. The freedom to fly! The ability to lift Sonic out of trouble! We played that game quite a bit, though the farthest we ever made it in one playthrough was the Carnival Night Zone--we got stuck on top of a moving drum because it never occurred to us that alternating up and down on the control pad would increase the magnitude of its movement range. My birthday came around that May, and I had a small party with my four best friends. While three of them argued over who could have a turn playing Extra Innings on the SNES, my fourth-grade friend and I chatted on the den couch. As a birthday present that year, he presented me with a simple slim envelope. Inside it was a hand-drawn card containing Spunky of the cartoon Rocko's Modern Life, and a postcard announcing that he had given me a year's subscription to the Sonic The Hedgehog comic book. Not being an ardent fan of the comics, the gift went underappreciated at first.. However, when Sonic comics continued to arrive in my mailbox month after month, I came to love that gift. It was like having my love for Sonic rekindled every month. There was a short delay before the subscription finished being processed, of course, and so my year's subscription extended into the following August, making it seem much longer than it actually was. My final issue was the comic's 25th outing, a Sonic CD tie-in featuring above-average art and a nicely-presented silver cover. Not a bad way to round out the subscription. In the meantime, Sonic & Knuckles had been released. I had a few abortive opportunities to play it, but as Tails did not make an appearance running alongside Sonic in the game, there was little room for two-player play. 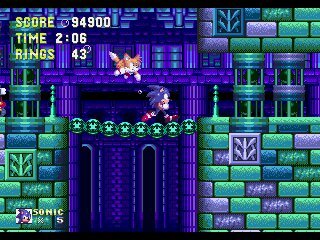 While Knuckles was available to play and featured clever climbing and gliding skills, that mode suffered for reasons similar to Sonic's I did not realize until much later that the game was not just a sequel to Sonic 3, it was intended to be played as the second half of the game. Full functionality could be attained by inserting Sonic 3 into the lock-in slot at the top of the Sonic & Knuckles cartridge, which would allow the full story to be played with any of the three main characters—and also with Sonic and Tails as a team. The fact that the locked-on version was the true game was poorly documented in the instruction manual, however, and so it did not occur to my friend or I to play through the game in locked-on format. Sadly, neither the fourth-grader nor the sixth-grader stayed at my little private school through graduation. The friend whom I had befriended on that field trip kept in sporadic touch for some time, and we managed to continue our tradition of winter sledding for a while, but we gradually grew apart. I miss them intensely. Only shortly after losing touch with those friends, I was at another acquaintance's house, browsing through his pile of comics. The Sonic cartoons had finished, and I had not been engrossed in a Sonic title since Sonic 3. Lo and behold, I found a pile of Sonic titles in amongst the comics. I browsed through them and was thrilled to find a solo Tails adventure, which was to launch a three-issue miniseries for the little fox. I read the content of the issue and was horrified. The story involved Tails falling in love with a female fox, who turned out to be a robot created by Dr. Robotnik. Tails finished the story by crying at the robot something very much like "You robbed me of my innocence!" Well, I wasn't having that. Tails is an eight-year-old. You may recall that my deep fondness of Tails is due largely to his being an youthfully innocent character, and I could not accept the comic series's throwing that out the window. Miserably, I put the comic down. I did not know that the Archie comic series had become to take on a life of its own, and thought that everything in it was Sega canon. I was already unhappy with Sega and had no Sonic game on hand to engage me; the abrupt change in Tails's personality was enough to alienate me from the series altogether. I kept all of my Sonic merchandise, but made little effort to get more of it. I did not continue to read the Sonic comics, which may have been a very good thing as the comics continued to get progressively darker and more serious. With all due respect to the comic's legion of fans, I was personally much happier with the upbeat, lighthearted early issues, before the publication began to run wild with characters, storylines, and alternate universes. I did, however, pick up Sonic CD and the Sonic & Knuckles Collection after they were released for the PC. 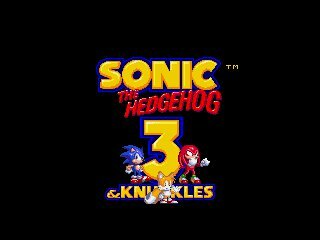 I had a lingering fondness for Tails, and so gave little attention to Sonic CD apart from watching the opening movie, but I did play through the combined Sonic 3 & Knuckles adventure, the way the game was meant to be played. Rather than play as Sonic and have Tails tag along, I decided on this venture to play as Tails alone. I was rewarded with the discovery that in this extended game, Tails also had a super transformation. 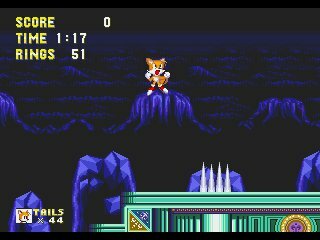 After gathering all seven of the Chaos Emeralds, and then gathering all seven of the Super Emeralds, the little fox could jump up, pose in mid-air, and begin flashing. 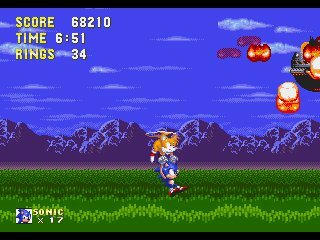 In this form, Tails was invincible, faster than before, and surrounded by a flock of super Flicky birds that would attack enemies. The Flicky birds, by the way, were among the enemies captured by Robotnik, but had originally come from a previous game, the appropriately-named Flicky, which predated Sonic by several years. Apart from that one game, however, I had little exposure to Sonic. The Sega Genesis became choked with peripherals before finally giving way to the Sega Saturn and then the Dreamcast. Each system had its share of Sonic games, but I had read bad reviews about several of them and eventually stopped paying attention. College came. My freshman-year roommates were not big video gamers, though one of them had a PC demo of the competition mode from Sonic 3, which he played incessantly. I thought it interesting, but when I mentioned the game he said that he knew nothing of it, so I gave it little thought in the long run. As 2001 began, Sega announced that they were exiting the console market. I felt a grim satisfaction, and surprisingly a sense of pity, in that they were no longer competition for Nintendo, but at the time was more concerned about Sony, which had broken into the market and had all but taken it over. Sega was out, and I noticed with some irony and more than a little interest that Sega would be producing games for Nintendo. It was a nice turn of events, and I was happy that the two companies, once fierce rivals, had decided to cooperate. I was intrigued, but not excited. I had not been engaged by a new Sonic title in many years, and I paid little attention to news of new titles. I thought that my Sonic fandom had finished running its course, and that I had long since laid it to rest. But then, when I least expected it, the spring of 2002 came along: and brought with it a Sonic Boom.